Your spiral staircase design has the same versatility as the rest of your home design. Home design is all about self-expression. Each room is essentially a blank canvas that can take on whichever design aesthetic you choose. Our spiral stairs are completely customizable from frames to treads to handrails. These are some of our favorite designs! Rustic interior design’s natural warmth has made it a favorite among cabin getaways and main residences alike. The key notes of repurposed lumber and rich color schemes create a cozy atmosphere that feels like home no matter where you’re from. The style is defined by naturalelements, like wooden beams, meeting industrial pieces, like metal worked furniture. 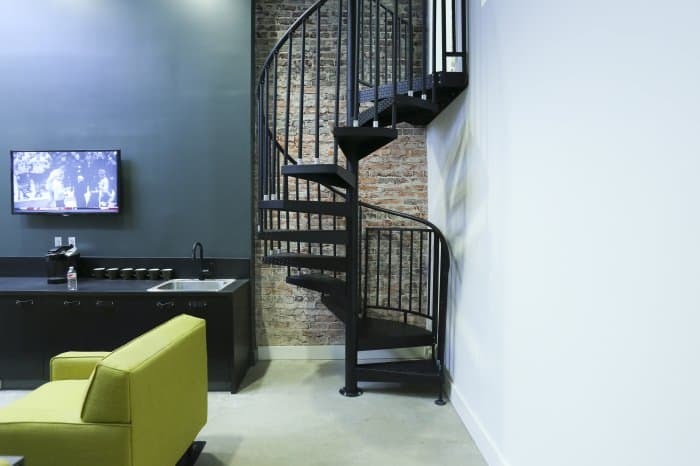 This particular stair was used as a means of access to a basement bedroom in an inverted loft. They wanted a stair that wouldn’t take too much room away from their open floor plan. The aluminum circle enclosure at the top of the stairs fits seamlessly into the open floor plan. 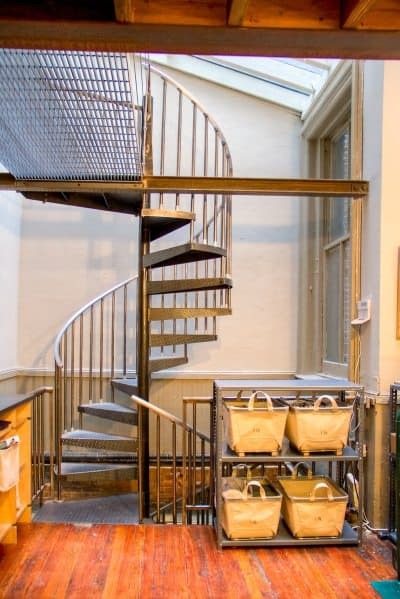 The spiral stair design itself fits well in the rustic décor with the meeting of the wood treads and classic steel frame. In order to make code, the homeowner opted for a more decorative Ivy Stencil tread style than the standard solid panel. Treehouses may have a place in childhood dreams, but anyone would love to have their own hideaway. When you think of a treehouse, chances are you think of a timber ladder, or maybe even tree branches, as your way up. It’s organic and keeps the integrity of the surrounding nature intact. While this might be the nostalgic option, it’s not always the safest. 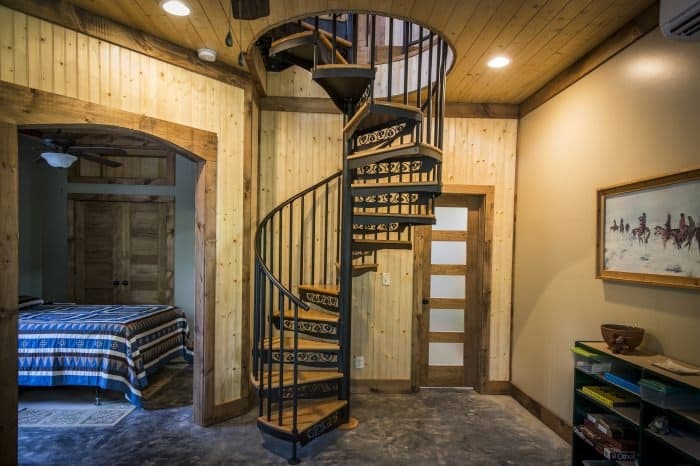 Believe it or not, you can have a full staircase in yourtreehouse. Spiral stairs provide a much safer option that will stand up to the elements. Ladders can be easily damaged in harsh weather and have thin rungs. Spiral stairs provide the stability of a handrail and full step and can be hidden in your design just as easily. 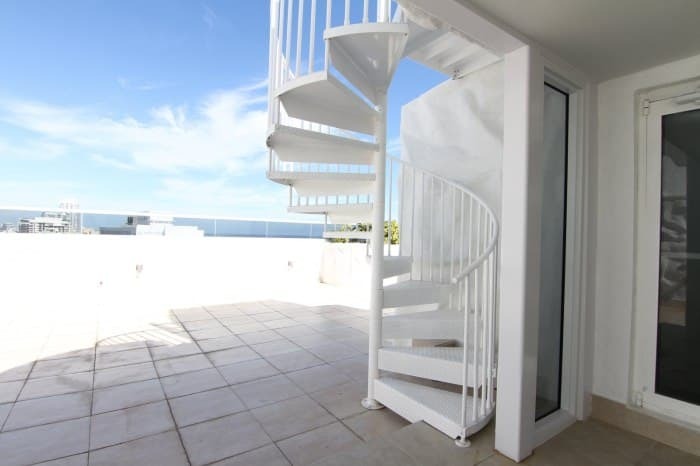 Our outdoor spiral stairs can be powder coated to match the color of its surroundings as well as seal the stair with a weather resistant coating. This featured stair blends beautifully into the design and its natural surroundings with the rich hunter green color. By having the stair come up through the middle of the treehouse, it is more easily hidden by the surrounding trees. Your deck and backyard are an extension of your home and deserve the same considerations. A popular option is to have a second floor deck with an open backyard below. If your backyard is a tight fit, you want to maximize the space. 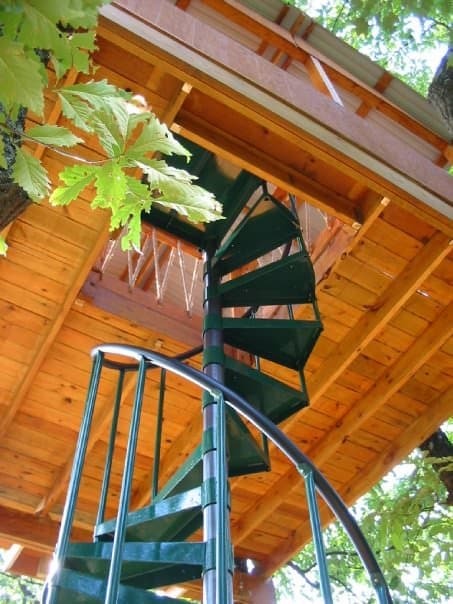 Spiral stairs are a great way to move from one level of your backyard to another without having to go inside. They save you square footage that would otherwise be taken up by a traditional straight stair. This particular stair that’s featured is an Aluminum Powder Coated stair. Aluminum is naturally rust prohibitive, but the powder coating, as previously mentioned, provides a weather resistant barrier between the stair and harsh elements. The crisp white color fits well with the modern home’s exterior and features a diamond plate non-skid tread for extra safety. Big cities are the perfect place for young professionals and budding businesses. They provide opportunities that the suburbs don’t have the capacity for. However, with big cities comes small spaces. Lofts and mezzanines are the perfect solution to create square footage. By creating a room above the original floor plan, you are opening up a space for other uses. Bedroom lofts are a popular option for an apartment, but in a home or business, loft or mezzanine offices are a great option. This particular stair is found in an urban office. With the entrance to the mezzanine office being placed in a corner, it was important to have a means of access that could reach the door without interrupting the entire floorplan. The stair is from our Classic Steel line with diamond plated treads and an aluminum primed black handrail. The stair doesn’t look out of place in the industrial modern hybrid décor. The black steel against an exposed brick wall pulls in industrial tones, while the clean lines and smooth curves of the stair and furniture speak to the modern school of design. Commercial spaces have a huge responsibility when it comes to interior design. The pieces must fit the personality of the company and its cliental while still being functional. If the business is multilevel, this creates an even more daunting task. You must then design two floors while providing a safe but trendy means of access. Most business don’t want to give precious square footage of a sales floor or dining room to their stair. A spiral stair is the perfect solution. They can easily be hidden in a corner or showcased in the center of the room without a large footprint. The first spiral staircase design being showcased in this category utilizes the first option. This galvanized stair is kept off the sales floor out of sight from customers, something that would be very difficult to maneuver with a straight stair. Not only does the grey galvanized finish create the perfect industrial design piece, but it also creates a maintenance free coating. The diamond plate non-skid surface of the treads makes it a great option for the work place. 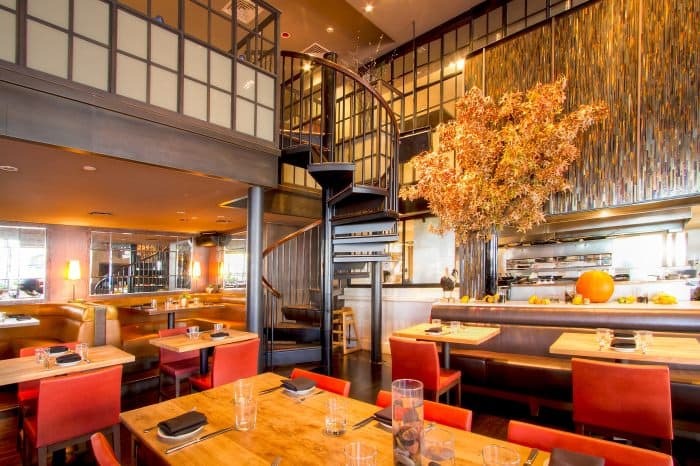 The second showcased commercial stair is the focal point of a dining room. The stair features a mix of materials with a classic steel frame and solid wood treads. As to be expected in a commercial space, there are code risers on the stair. This stair is the perfect showcase piece for a restaurant dining room. The rich tons of the wood pulls in the red and yellow accents around the room. The rest of the décor is simplistic with geometric shapes and clean lines. This allows the elegance of the spiral stair to be highlighted. While a spiral stair is iconic in shape, it's design style can be customized and molded to meet your design aesthetic. Whether it's through the size, materials used, or colors, there is always a spiral stair that can fit into your space. A quick call to one of our consultative designers can give you a jump start to your project! They can walk you through each step of the design process and help you design a one of a kind stair design for your space.